My enjoyment of the Gears series up to this point is such that Gears 3 is deserving of a position on this list, even if the overriding impression that I was left with was disappointment. That’s unfortunate, because it wasn’t the fault of the game itself – that was as strong as ever – but rather the anticlimax of a finale. In retrospect, both its predecessors ended on notes that swung between frustrating and insultingly simple, so perhaps it shouldn’t be so surprising, but to leave so many unanswered questions was just messy and felt like a lazy setup for inevitable returns to this universe. 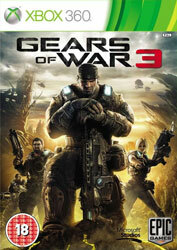 Frankly, though, who plays Gears for the story? Its narrative accomplishments can be counted on one hand, and one of those is serving as a mildly distracting vessel for what is still the benchmark in this third-person cover shooting sub-genre. Although I didn’t think that Gears 3 was the series’ high point, mainly thanks to some flirtations with almost Halo-style, more open battlefields that really didn’t work for me, it had a lot of great ideas and a mercifully more diverse graphical style. The latter went a long way towards making the game feel like less of a stereotype than its characters frequently did. With three of these games in a generation, though, I don’t feel like there’s more to be said with this franchise for a while. It’s the right time to leave it alone until there are some worthwhile new ideas, hence this one’s diminished standing in this list when compared to its predecessors. Still one of the best action series of this generation, then, given a send-off that slightly underwhelms.